Coach Michele Eray talks to us about Maggie, training and the benefits of ACE. 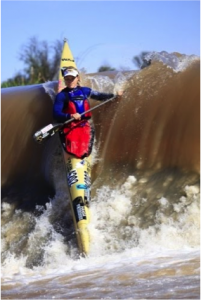 Kayak coach Michele Eray is a rock star in her own right as a surfski World Champion and a kayak Olympian representing South Africa in 2008. Michele is the founder of MultiCoach, an online elite level training platform for paddle sports and coach to Maggie Hogan, U.S. Olympian and participant in the Athlete Career and Education Program. Tell us a little bit about what it is like to coach Maggie? Coaching scenario’s have changed a lot from the traditional set-up of a Eastern European male coach with a big group of athletes, to something a lot more dynamic. We are not that unique, as there are lots of groups with young coaches and small numbers of athletes in their group. Maggie and I are the same age and have similar sport backgrounds. We’re both surf lifesaving and active beach types. Coaching Maggie is great. She is an incredibly hard worker, so she does the training. I have self-coached before, and the main problem is that it’s hard to see what you’re doing from an outside perspective. More often than not, we tend to over-do things! Maggie included! Maggie has been doing this paddling thing for a while, so she knows a thing or two! She adds her input, which I value, and this is helpful to me. We make a good team, and are pretty similar in our approaches. It has been a pretty effortless coaching relationship so far! What was it like watching her qualify for Rio? It was both terrifying and a total relief! The amount of work we have put in (I am also her training partner so I feel the pain of the sessions!) and sacrifice (no steady income) made this a huge risk for both of us. I plan the training, help her execute it, and work on our travel as well as other planning. It was terrifying because I am in control most of the time, but once it’s race time, I watch her push off the dock and I have no way of helping her. It was a relief to end the stressful build up. I knew she could do it! I wanted her to walk away from the trials with a “perfect” race, and that would be good enough. It is a totally different feeling than qualifying yourself! I was happier for her than I was for myself back in 2007! 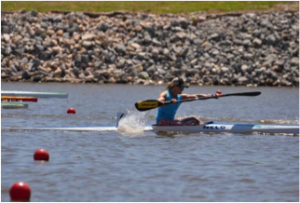 What does a typical week of training look like for a k1 500 sprint kayak athlete? The K1 500 is a tricky distance. Too long to be a true sprint, and too short to be endurance event! I see it as similar to the running 800m. The 500m paddler needs great aerobic endurance, a high lactate tolerance, and of course, speed and speed endurance to cover the 500m as fast as possible! We do 6-10 paddling sessions (1-3 per day) which are usually 1-2 hours in length, about 4 strength type sessions, and some running as cross training. In the build-up part of the season we do other forms of cross training – some ocean work and fun activities to keep it fresh. I have a background in Biokinetics, so the strength work we do is both injury preventative and sport specific to help her be more explosive on the water. I try keep it interesting as well, with this amount of training, it can get monotonous! What was the hardest thing you faced making the transition from Olympian to coach? I have always loved the planning and program design part of training, and have been writing programs for myself and others for a while, so making the shift to coach from a planning/program writing perspective has been great. I love testing out ideas, and we do a lot of experimenting! There are always new ideas from other sports and coaches out there, and I feel that I never stop learning, which makes this very exciting. The hard part is going to events and not racing. I absolutely love racing! Being an athlete, you become so self-orientated, and making the move to coach has been refreshing. Now my focus is Maggie! As a coach, how do you feel about the career development and job placement assistance services available through the ACE program for elite athletes? It is fantastic. ACE has enabled Maggie to earn a little bit while she trains up to 6 hours a day! Being mobile helps, as we are always traveling! Do you find that if an athlete has a part-time job, it can alleviate some of the financial stress that comes with competition? Definitely! And besides that, it gives the athlete a more well-rounded approach to life, and some perspective in the real world. What benefits do you see that Maggie has gained from her participation in the ACE program over the last quad? Besides the financial benefits, she gets to do something outside of the grind of daily training. It helps keep her connected to what the rest of the world does all day. What would you say to other coaches who might be hesitant to encourage their athletes to work a part-time job while training? Why do you think it is important for an athlete to have a plan for life after sport? Training and competing is such a consuming habit! And then all of a sudden it ends… Athletes are naturally competitive and usually successful at everything they do. The trick is to make sure you are ready for life after sport and to realize you are a part of something bigger. What advice would you give to athletes that are thinking of transitioning out of sport after Rio? It will be tough, but it is also exciting! Take it slow, and give yourself a time buffer to get into your groove. Plan on competing at another event a few weeks later, not necessarily to be competitive but to get out there and race for fun! Other people will want to know about your Olympics, and this is a great chance to share your experience and hopefully motivate others to do go for their goals! This will be your first Olympic experience working outside the boat as a coach. What are you looking forward to the most about this new Olympic experience? I am hoping the pressure will be less, but somehow I doubt it will be! Mainly, I am so stoked that Maggie has reached this goal after missing it twice, and I am excited to share in all the fun parts of the Olympics with her! My favorite part of Beijing was the Opening Ceremony, and of course, the Village Food Hall! 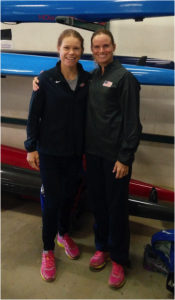 Watch for Maggie and Michelle as the Canoe Sprint action gets underway in Rio! Follow Michele on Twitter @Mich_Eray. Follow Maggie and Michele’s Rio journey at their MultiCoach blog! If you are interested in the ACE program, check out the Athlete Career and Education program page.